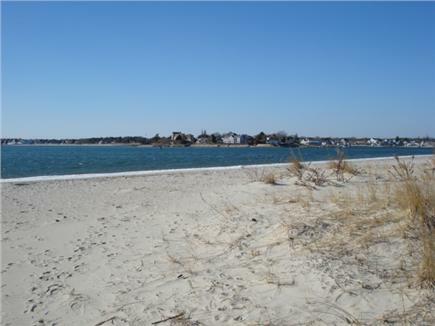 Beautiful View of Lewis Bay/Half Block to Secluded Beach! Have your morning coffee looking at the beach! Our beach just steps away! Large kitchen with everthing you need! Queen bedroom with view of bay! Downstairs Master bedroom with king. Dining table for eight with view of the bay! Sunny game/art room and children get away. 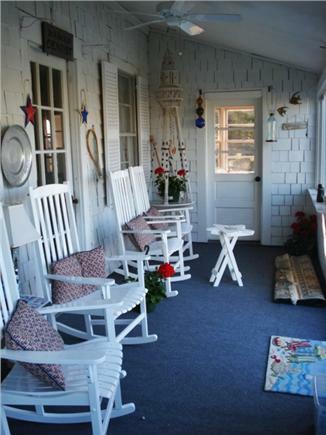 Relax in rocking chairs on front porch and watch the boats go by. 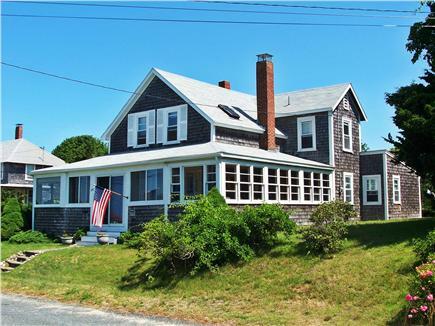 This charming Cape Cod style cottage has breathtaking views of Lewis Bay and is only 300 feet to the beach.. Staying here is truly an experience in relaxation and beauty. No more loading sandy feet and toys in the car: you can walk across the street to the beach. 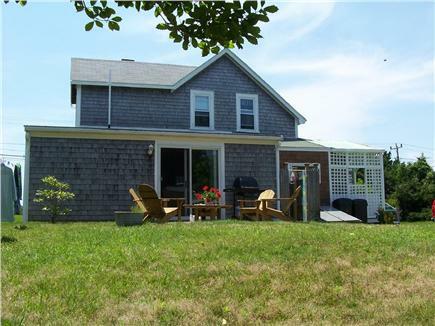 Located in Hyannis Park, West Yarmouth, this property is also within walking distance of the ferry docks and ''Main Street, Hyannis.'' The neighborhood is quiet and the yard is huge. There is one master king suite downstairs. Upstairs are three bedrooms and a full double sink bath. 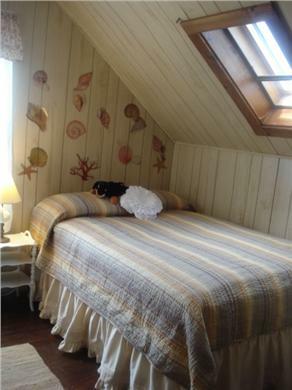 All bedrooms have windows facing the bay and our great southern breeze! 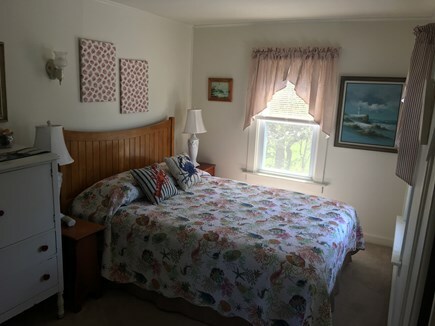 You are going to love our large, fully-equipped kitchen with breakfast area, front- and side-enclosed sun porches, and a laundry room with a washer/dryer. Our enclosed outdoor shower has hot and cold water. The backyard patio has a gas grill and Comfortable furniture for your outdoor enjoyment and evening cocktails. Verizon DSL with wireless router is available free of charge. On the first floor is a master king bedroom with private bath. 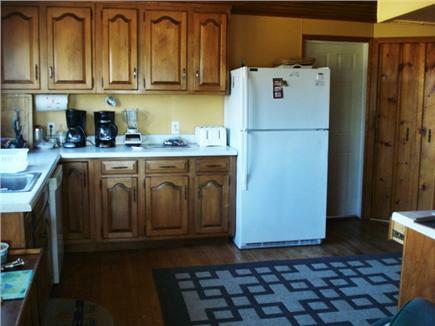 Also on the first floor is a large kitchen which is open to the dining area. 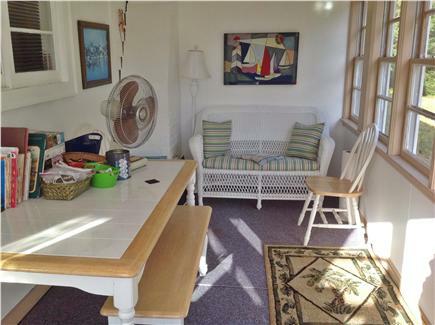 Off the dining area is the living area and a front sun porch. 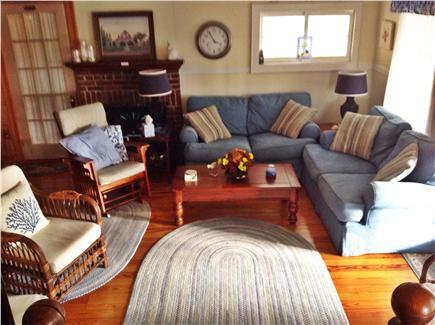 There is also a side room for relaxing or playing games.Plenty of room for two families. There is also a half bath on the first floor. 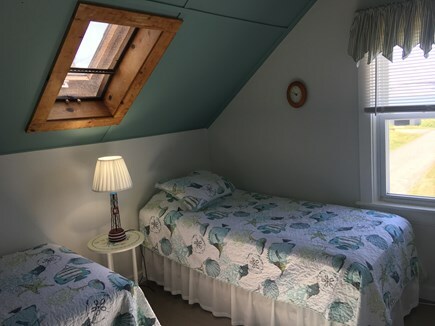 On the second floor you will find one queen bedroom, one twin bedroom with two beds, and one bedroom with a double bed, and a large bathroom with a walk in shower and two pedestal sinks. All baths have been updated with tile. Our southern exposure provides us with cool breezes off Lewis Bay all summer. Our large yard gives children plenty of room to play, and the quiet street is perfect for biking or walking. We have adult bikes and one child bike in the garage waiting for you. There are beach chairs and toys for your use, too. Lewis Bay is ideal for canoeing, kayaking, and fishing. Birders, don't forget your binoculars! Song birds and water fowl abound. As you sit on the beach, ferries from Hyannis to Nantucket grace the skyline. The water in Lewis Bay is warmer than the ocean making it great for children. Furth of July fireworks can be enjoyed from our front porch or beach and that week also is tax free! Our home has a downstairs master suite with a sliding door out to the patio. Hot/cold outdoor shower has no steps and is next to our patio. A lovely, homey place with everything one needs there or nearby. Even our little grandchildren loved it. Seconds to a beaches, quiiet neighborhood, lovely views of passing boats on their way to the Islands, very short drives to endless restaurant choices or just good old fashioned ice cream cones. Can't wait to be there again. Thanks, Sherry. It’s a pleasure as our guests. We have stayed here numerous times. It just keeps getting better. Love the new bathroom and renovations to the old ones and the mater bedroom is a gem. The location is close to everything. Great bike rides. The view of the water is wonderful, especially the sunsets!! Just a skip to the beach. We even like rainy days as the house is so cozy to snuggle with a good book. The back yard is a great retreat, so beautiful. Like to keep the bird feeder full, what a show. Everything you need for a perfect vacation is there. Kitchen is super and stocked! It is so clean and decorated with style. Loved the spacious house--what a view! Everything we could have possibly wanted was provided. Beach was great for children--equipment and cart a bonus! We'll be back. We have vacationed at this property for the past two summers with our kids and another family. 4 adults and 4 kids fit very comfortably. We loved the house and the back yard which was perfect for an after dinner whiffle ball game. 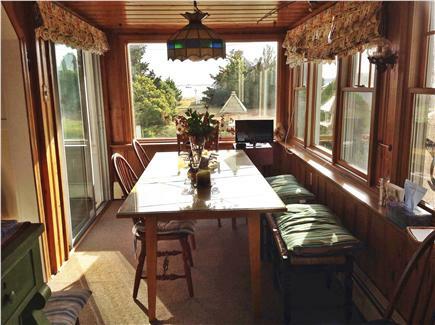 The table in the kitchen has a very pretty view of the water, and the rocking chairs on the porch are perfect for your morning cup of coffee. The walk to the beach is 30 seconds and most days we had the run of the beach. Great beach for kayaks and stand up paddle board as it is protected in the bay. It also has great seashells and great boat watching. The kids love to watch the ferries and yachts on their way out to Nantucket Sound. 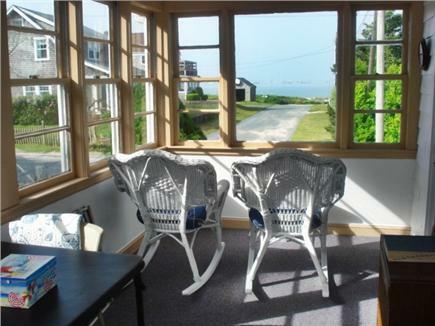 The location is very central on the Cape, and it is a good walk or a quick ride to some great restaurants. A slice of heaven! A perfect Cape Cod cottage. Very cozy and comfortable. Look forward to returning. A wonderful Cape vacation. Loved everything! Thanks for sharing you home...it's perfect! Year #7 at a great house. Thanks for sharing you treasure! See you next year!! Laura and Carl Lilieberg have been renting this home since 2001. 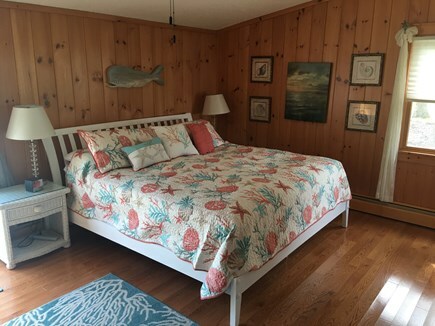 Laura is a retired teacher and school administrator and Carl is a retired US Naval Officer.. Over the last 15 years, they have remodeled, painted, and added features to make 50 Park Ave. a great vacation home. They strive to make your visit a great one. 50 Park Avenue's location so close to the beach is one of the many things that make it a great house. The Lilieberg's added touches are evident in every room. The quiet neighborhood adds to the charm of this property! The large yard is also a plus for guests.